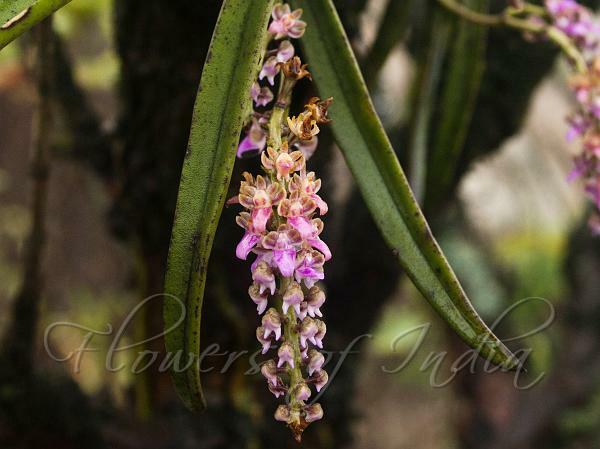 Long-Leaf Diplocentrum is an orchid growing on trees, with stem 6-8 cm long. 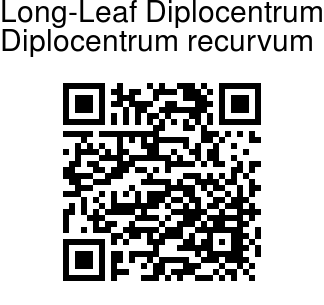 Leaves are linear, 15-20 x 0.4 cm, keeled, or nearly round in cross-section, blunt, mucronate. Flower are pink, in branched 25-35 cm long racemes. Dorsal sepal is 3 x 1.1 mm, inverted-lanceshaped, bimucronate, 3-veined. Lateral sepals are 4 x 2 mm, curved oblong, lanceshaped, blunt, 3-veined. Petals are 3 x 1.5 mm, oblong-lanceolate, somewhat pointed, 3-veined, lip 6.9 x 3 mm, oblong-lanceshaped, blunt, 7-veined, with 2 collateral spurs. Disc has a fleshy ridge, forking at tip. Long-Leaf Diplocentrum is found in south India and Sri Lanka. Photographed at Skandagiri Hills, Chikballapur District, Karnataka.